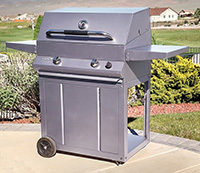 EasyChef Premier Outdoor Cooking Systems from Sierra Products, Inc.
Sierra Product's offers one of the lowest price points in domestic manufactured SS gas grills. EasyChef's chassis and critical components are constructed of a commercial quality T304 stainless steel. Fully welded construction guarantees years of trouble free operation and includes a 3,5,7 Year Limited Lifetime Warranty. Head and carts are fully assembled in the box. Available in two sizes, the EC24 with 488 sq. inches total cooking area and the EC30 with 638 sq. inches total cooking area. 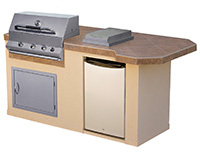 Both models can be ordered with a rear rotisserie burner, an EasyChef unique design and constructed entirely of stainless steel. Available in LP or Natural Gas. Perfect for legacy grill replacement, EasyChef’s can replacement old Turbo and FireMagic grill installations. Fire Magic, Barbeques Galore, and many others. 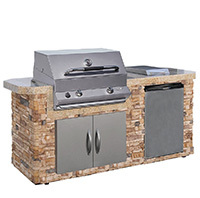 Designed to provide quick, balanced heat and grilling surface temperatures over a wide operating range. Welded 304 stainless steel rod, the optimum cooking surface. Both the EC30 and EC24 provide generous cooking areas. Limited lifetime warranty. Minimizes flare up and maximizes heat distribution by absorbing and radiating heat evenly across the cooking surface. A multi spark igniter will start your grill quickly and easily, just like your kitchen stove. It comes with a longer than normal 3 year warranty and requires no batteries. Your assistant for reliable temperature control. A full range of installation options, select the one that best suits your needs. 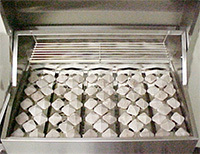 Side Burner, Easy Smoker Tray, Rotisserie Kits, Covers and Griddle. With a full range of installation options, select the one that best suits your needs. 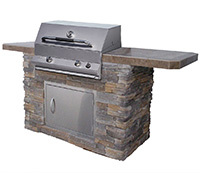 With just a few nuts and bolts an EasyChef grill head can easily be installed into an island or on a cart. For legacy grill replacement, EasyChef's can replace old Turbo's, FireMagic, and many other legacy grill installations. There is a critical difference in the properties of liquid propane gas (LPG) and natural gas (NG). For your safety, it is highly recommended that local building codes be checked before beginning your construction. EasyIsle SS Double Doors & Single Doors available in several sizes. Rotis Capacity (lbs) 14" 14" 14" 14"
Rotis Swing diameter (w/o cooking grids) 10" 10" 10" 10"
© 2019 Sierra Products, Inc. Proudly Made in the USA.